OPW 10 Series Emergency Shut-off Valves are installed on fuel supply lines beneath dispensers at grade-level to minimize hazards associated with collision or fire at the dispenser. If the dispenser is pulled over or dislodged by collision, the top of the valve breaks off at the integral shear groove, activating poppets and shutting off the flow of fuel. Single-poppet models shut off supply flow, while double-poppet models shut off supply as well as prevent release of fuel from the dispenser"™s internal piping. The base of the Emergency Valve is securely anchored to the concrete dispenser island through a stabilizer bar system within the dispenser sump or pan to ensure proper shearing action. The valve base is secured to the stabilizer bar using a three-point boss mount system or a U-Bolt Kit (not included); 10UBK-015 (1-1/2") and 10URK-0200 (2 sold separately). Valve inlet (bottom) connections are female pipe threads and outlet (top) connections are available with female threads, male threads or a union fitting. Other options include suction system models with a normally closed secondary poppet which maintains prime, and models with external threads on the inlet body which connect to secondary containment systems. The primary poppet is held out of the flow stream while the secondary poppet is held normally open to minimize head loss across the valve and to protect the poppet seals from damage and erosion. True 1-1/2" (4 cm) and 2" (5 cm) body sizes ensure maximum flow. A fusible link trips the valve closed at 165° F to shut off fuel supply to the dispenser. Having the main poppet seat as an integral part of the valve top assures a new, clean seating surface is installed each time the top is replaced. This design also ensures that the integrity of the seal between the valve top and bottom is verified during line testing and allows full inspection of the main poppet when the top is removed. A stainless steel main spring, a Teflon®-coated brass packing nut, and a copper/nickel/ chrome-plated brass stem are designed to prevent tar build-up and corrosion from interfering with poppet operation after long periods of normal service without activation. A 3/8" (9.5 mm) Test Port allows the piping system to be air-tested without breaking any piping connections. 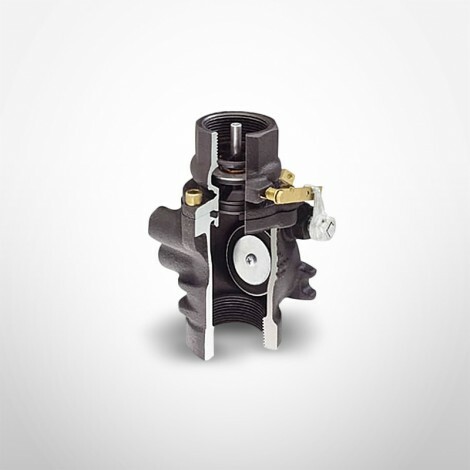 Relieves excessive pressure over 25 psi caused by thermal expansion of fuel in the dispenser piping system in the event of fire (double-poppet models only). Low-Profile TopsFemale and Union-top double-poppet valves have a low-profile top to allow upgrading from OPW single-poppet valves without changing existing piping. Valves are boss-mounted to stabilizer bars in sumps and pans or mounted to bars embedded in the island with optional U-Bolt kits 10UBK-015 (not included). Versatile Combination Body (boss mount/U-Bolt mount) models are available to accommodate most mounting applications with one valve style. Listed for use with gasoline and 85% and 100% methanol. All OPW 10 Emergency Shut-Off Valves meet requirements of UL STANDARD 842.